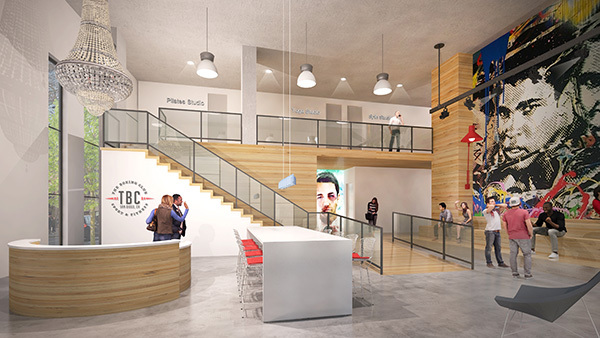 I am pleased to announce that The Boxing Club – a fast-growing, award-winning fitness club in San Diego – is expanding to East Village this spring. Originated in La Jolla’s University Town Center shopping area, The Boxing Club (TBC) tapped into the growing demand for high-quality fitness training based on combat arts. With most fight clubs lacking upscale facilities and fitness clubs missing real-world combat proficiency, TBC filled the void by creating a unique experience for its customers, which brought together the two worlds of fitness and combat in an ultra-modern setting and customer-centric environment. 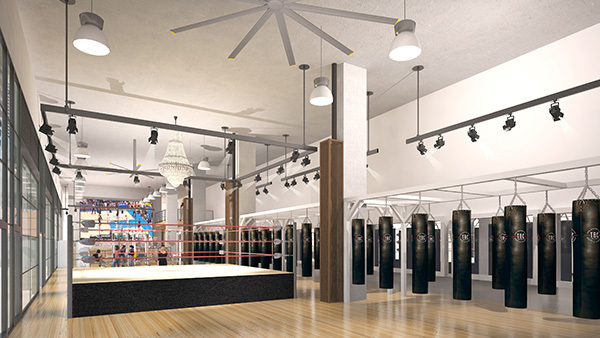 The yin yang design of the 13,000-square-foot TBC East Village location will reflect the company’s approach to fitness and training programs that offer rigorous boxing, kickboxing, muay thai and jiujitsu training, alongside indoor cycling, high intensity interval training, yoga and Pilates classes in the state-of-the-art facility. A 30-foot graffiti mural will balance out the crystal chandelier which will hang over the boxing ring, while the grand glass ramp will lead to a massive painting of Edward Norton’s character in the famed “Fight Club” film. Sharoshkin is actively working to make an impact on the progress of East Village with this new location. After emigrating from Russia in 2004, Sharoshkin worked as the janitor for The Boxing Club to pay for his fighter training. While fighting as a professional muay thai fighter, he worked his way up to a trainer and then became the training director for the gym. After years of fighting, he decided to hang up his gloves and set his sights on a new goal. In May of 2014, Sharoshkin was able to fully realize the dream he had when he first moved to the U.S. from Russia a decade earlier, when he became the owner of The Boxing Club. Since taking over, he has been able to not only grow the company, but also give back to the San Diego community. With his amazing drive and lack of fear, he hopes to expand the brand and culture he has created at The Boxing Club to the Downtown area of San Diego. We at the East Village Association are delighted to welcome TBC to our developing footprint. Artem and the rest of the team have been great to work with both professionally and personally. With their passion for sport, attention to detail, and a sense of community, TBC offers a new tone in gym appreciation, in that working out is not only good for your health, but is a healthy way to network and make lasting neighborhood connections. TBC East Village membership pre-sale specials are currently available. To learn more or sign up visit bit.ly/2ETCJwT or stop by their pre-sale studio location on 15th and J streets. The East Village Association (EVA), the nonprofit that represents the 130-East Village Business Improvement District, has announced their largest fundraising event of the year, the eighth annual Padres Opening Weekend Block Party. Scheduled for March 30–31, the popular and festive block party is held on J Street to celebrate the first home games of the Padres’ 2018 season. Funds raised from this annual event allow for the successful planning and operation of EVA community beautification projects, business networking events and a “seat at the table” as the leading community voice. The EVA is looking for local sponsors to participate and are offering several unique sponsorship tiers. Those interested would not only increase their brand awareness and help the EVA meet its goals, but also support and interact with San Diego’s local Major League Baseball team and its many fans who enjoy the block party each year. For more information, visit bit.ly/2ouOsrD.